Tuesday, 16 April 2019, 5:34a.m. The famous Paris cathedral has been virtually destroyed in a massive blaze - its roof and spire have collapsed. The heart of Paris was torn asunder as a fire ripped through Notre Dame cathedral and gutted Europe's most loved historic monument. But even as firefighters continued to battle the blaze, French president Emmanuel Macron immediately declared the cathedral would be re-built - starting tomorrow. "We will rebuild because it is what French people expect, it is what our history deserves. Victor Hugo helped save the cathedral almost two centuries ago by immortalising the edifice in his novel The Hunchback of Notre Dame. Today, the deputy interior minister said saving the structure was "not certain". Later a fire officer at Notre Dame said that most of the cathedral's "structure" has been saved, including the two towers on the main facade. A firefighter was hurt in the blaze. Some 400 firemen appeared powerless to prevent the blaze spreading after it first broke out at 6.50pm local time. Despite reaching the scene within 10 minutes, their hoses could not reach the highest parts of the cathedral from the 30m high ladders that were dwarfed by a tower three times that size. France and the world could only watch the live TV images as the roof caved in and the flames continued to rage. Fire Chief Jean-Claude Gallet said they were not sure they would be able to stop the fire from spreading, after it engulfed the roof and spire, and one of the church's towers. 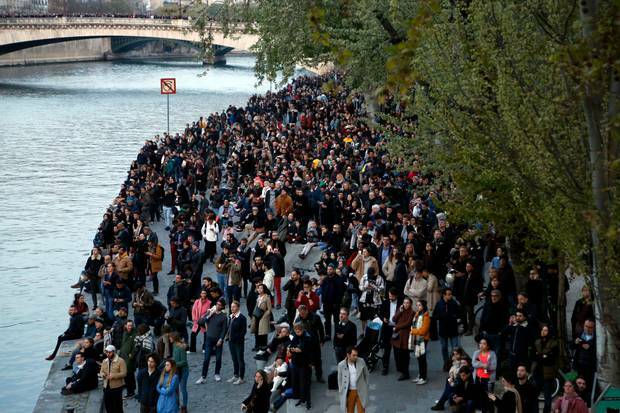 One Parisian bystander, Fred, told the Telegraph: "People are just in a state of total shock. It's almost like a cultural September 11." In a tragic twist of irony, it appears the blaze began on scaffolding near the top of the building where major renovation works intended to save the building from collapse, had just begun. Christine Moreau, a local resident, choked back tears as she described her horror. "It's tragic. I can't believe this is happening. Notre Dame is part of the heart of Paris and part of our hearts too. Why couldn't more have been done to put out the blaze? "This is really sad - the saddest thing I've ever stood and watched in my life," said British tourist Sam Ogden. "It looked tiny to begin with, then within an hour it all came down," Ogden added. Anne Hidalgo, Paris' Mayor said: "No words can describe the pain I feel in seeing Notre Dame ravaged by flames. 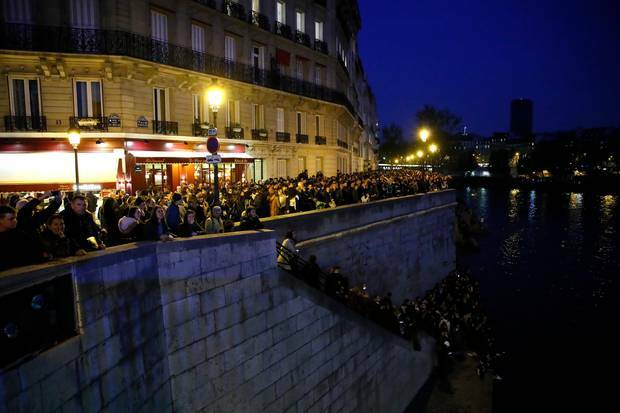 Tonight, all Parisians and French mourn this emblem of our common history." She said that Paris, however, would find the force to rebuild the edifice from its motto: "Fluctuat nec mergitur" (Tossed by the waves but does not sink). "Everything is burning, nothing will remain from the frame," Notre Dame spokesman Andre Finot told French media. The majority of the Cathedral's artefacts, including Crown of Thorns - a relic believed by some to be the crown worn by Christ at the Crucifixion - and the Holy sacraments, were reportedly saved from inside the main building. But as the flames failed to abate, it appeared that the cathedral's famous stained glass windows had melted in the heat. Some in the crowd around the cathedral were angry that helicopters or planes had not been brought in to spray the flames from above, a sentiment echoed in remarks by US President Donald Trump. "So horrible to watch the massive fire at Notre Dame Cathedral in Paris. Perhaps flying water tankers could be used to put it out. Must act quickly!" However, the Paris fire brigade swiftly tweeted in response: "Dropping water on this type of building could in cause the entire structure to collapse." In a sign of the shockwave the fire had caused to the nation, Emmanuel Macron, the French President, postponed a crucial televised address to the nation which he had been due to make last night in bid to quell the "yellow vest" revolt that has wracked Paris with violent protests. Instead, he rushed to the scene with his Prime Minister, Edouard Philippe and Interior Minister, Christophe Castaner to see the "terrible fire ravaging Notre Dame" for himself. In a tweet he expressed the "emotion of a whole nation" on seeing Notre Dame ablaze. 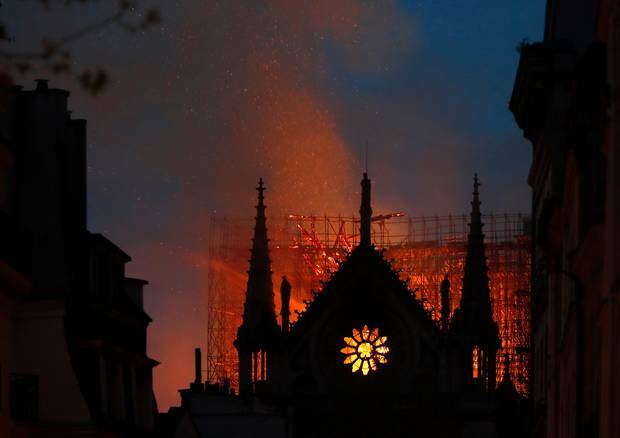 "Like all my compatriots I am sad to see a part of us burn this evening" he said, expressing solidarity with "all Catholics and all French people." Turning 856 years this year, Notre Dame is one of the largest and best-known cathedrals in the world, attracting some 14 million visitors a year. But the much-loved gothic masterpiece has been in a perilously poor condition at many phases in its life. During the French Revolution in the 18th century, the cathedral was vandalised duing widespread anti-Catholic violence: its spire was dismantled, later to be rebuilt in the 19th century, its treasures plundered and its large statues at the grand entrance doors destroyed. But it was reborn after Victor Hugo turned it into the key protagonist in his novel. Shortly afterwards a restoration project lasting two decades got underway, led by architect Eugene Viollet-le-Duc. It survived two World Wars and its bells rang out on August 24, 1944, the day of the Liberation of Paris from German occupation at the end of the WWII. "This is Paris' jewel in the crown," said Michel Picaud, head of the Friends of Notre Dame Foundation, which has been spearheading a campaign to gather private funds for its restoration. Notre Dame de Paris cathedral, whose construction began in 1160, is an icon of the Paris skyline. Its facade stands 226ft tall. Its name means literally "Our Lady of Paris" and the building is one of the finest examples of French Gothic architecture. Notre Dame was desecrated in the 1789 French revolution, but was restored between 1845-1870 by the architect Eugene Viollet-le-Duc. The restoration project was sparked partly as a result of the popularity of Victor Hugo's 1831 novel The Hunchback of Notre-Dame. Until the completion of the Eiffel Tower in 1889, the towers of Notre Dame were the tallest structures in Paris. The cathedral is famed for its three magnificent stained-glass rose windows which date from the 13th century. Notre Dame houses three important relics: the Crown of Thorns, pieces of the True Cross and one of the Holy Nails from the crucifixion. It is home to one of the finest pipe organs in Europe. The current instrument has 115 stops and more than 8,000 pipes. The cathedral has 10 bells, with the largest, Emmanuel, weighing in at 13 tons. For centuries they have tolled at historic moments - from the coronation of kings to the end of two World Wars.